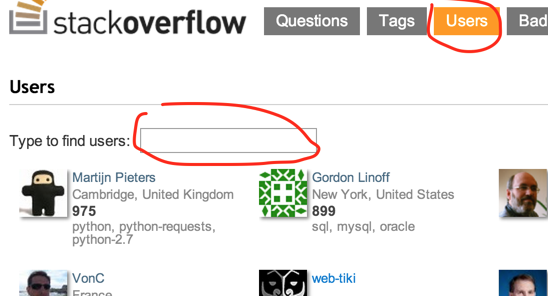 I would like to know how can I search for a Stack Exchange user and see their profile. I use google in case I'm looking for someone and I don't know their username. For example, if my company is considering hiring a contractor, I like to check and see if the programmer has an SO account. However, I don't know their SO username in this case. If they have included their name in there bio, I can still find them. Example: Assume I'm trying to find Mark Murphy. Searching the users only comes up with usernames of "Mark Murphy". I see that Mark Murphy is actually CommonsWare, who is the first result of the search. I can see that I've now found the correct person I was looking for when I could not find them on the users page. Not the answer you're looking for? Browse other questions tagged support users profile-page search . How can any user profile views have “0”? How do you report an underage user to Stack Exchange?